It is very important to finish any dormant pruning and spraying prior to the weather warming up. To help you complete this task we would like to share a few tips to make your plants happier and more productive. It always helps to identify what you should prune off and what not to prune. The difference between basal canes and suckers can be difficult for the inexperienced rose gardener. A basal cane is the lush growth that originates at the bud union. The foliage and thorns have the same characteristics as the top growth. This is the best wood on the plant and should be encouraged. A basal cane may, however, grow very tall with a large cluster of blooms on the end. To prevent this, pinch out the tip of the cane when it is about 18″ tall. On the other hand, a sucker comes from below the bud union point where branching begins. The foliage, thorns, and types of growth are entirely different from those at the top. This type of cane is generally much longer and more willowy in growth than a basal cane, and does not terminate in a bud. Suckers rob the top growth of needed nourishment, and should be cut off close to the point of origin. It is difficult to have a set rule for pruning, as various types of roses require different methods. As a general rule, however, one should cut out the old wood, keep the new wood, and above all, retain the symmetrical shape of the plant. New wood is generally almost all green, second year growth is green with grey or brown streaks, and third year wood (the stuff you want to cut off) is almost solid wood-looking with the brown or grey branches showing very little green. The remaining new wood should be cut back at least half the length of its growth during the previous season but not be pruned below 18″ inches in height. Each cut should be made a quarter-inch above an eye facing the outside. Weak wood and crossed branches should also be removed. Plants pruned severely will produce fewer, but higher quality blooms. Moderate pruning will result in a greater abundance of blooms. Climbing roses, as a rule, produce blooms on canes that grew during the preceding year. You will get more blooms from your climber if the canes are trained to run parallel with the ground. Older plants may be pruned by removing several of the oldest canes, characterized by their heavier growth and woodier appearance. Floribunda roses are pruned in much the same way as hybrid teas, but require milder pruning which results in a greater mass of bloom. Like all living plants, roses may be attacked by insects and fungus diseases. 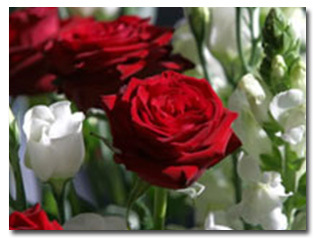 It is important to apply one application of dormant spray to each rose. A good copper fungicide such as Monterey® Liqui-Cop, combined with a spray oil such as Ortho® Volck Oil may be used to control both over-wintering insects and diseases in a single spraying. Mulching is very important. It keeps the soil cool in summer and warm in winter. It retains moisture, controls weak growth, and renews and rebuilds the humus content of the soil around the plants. We recommend using Gardner & Bloome® Soil Building Compost or a bark product like Sierra® Walk on Bark. Roses are heavy feeders and need food to get the maximum bloom, but not in the winter dormant season. The rule of thumb is to give them their first feeding in March or when the rose has six inches of new growth (whichever happens first). After that, every two months through October is recommended. For the best organic results, use Dr. Earth® Rose & Flower Fertilizer. Roses can take lots of water during the growing season if the drainage is good, but will not tolerate wet feet in the winter. You should not have to water your plants until there is at least 6″ inches of new growth and the soil starts to dry out. Avoid watering at night to cut down on fungus and disease. On newly planted bushes, cut off the flowers on the shortest stems, to allow more nutrients to go into the remaining flowers. On established plants, you can cut as high as the second (five-leaf) leaflet or as low as any two leaflets above the previous cut in order to promote more blooms – leaving as much foliage as possible. Single and semi-single roses should be cut just as the petals open showing color; double roses as the petals unfurl to not over half-open; very double roses when about two-thirds open. It is best to pick in the late afternoon, when the sugars in the plants are at the maximum. Re-cut the stems under running water and place stems in a vase filled with water and a small amount of sugar or a (non-caffeine, non-diet) clear soft drink such as Sprite or 7-Up.